There are a handful of Australian native plants that are truly iconic and Waratahs are very high up on this list, possibly in the top 3….whenever I see them in the bush it is easy to see why we are all so captivated by this bold bloom. I know many people that try to grow them in their gardens with no success, trying again and again 5 or 6 times before they give up. I can only really think of possibly one reason for these sorts of failures with Telopeas and that it loving them to death, they really do just want to be left alone. This specimen in the image above is just that, left alone. As you can see it doesn’t get pruned, I doubt it would get watered and fertilised? nah! This Telopea speciosissima is growing in full sun in an exposed open position in a well drained soil. 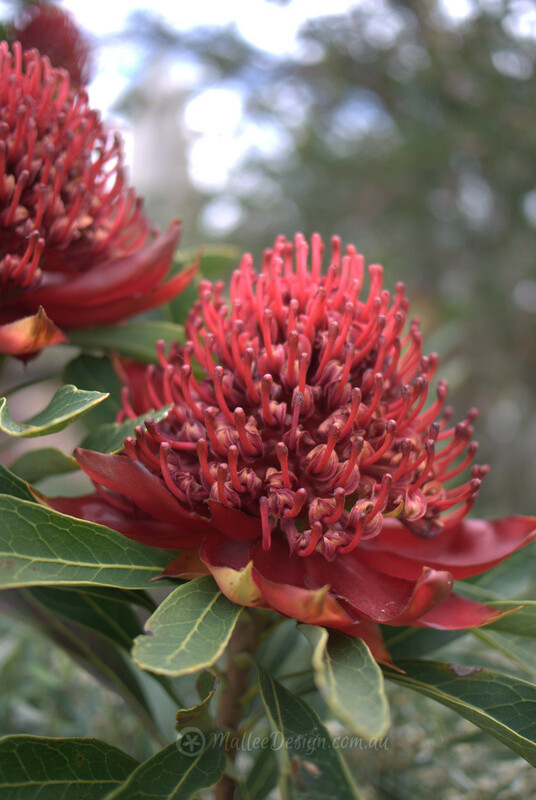 The thing Waratah’s hate most is too much water which cultivates humidity around the base and leads to fungal problems, they need excellent drainage with adequate air circulation. In the bush they grow as an understory plant, sometimes in dappled shade but they appear to be adaptable to various situations but a semi-shaded position or at least shade from afternoon sun is desirable. Try to ensure they have a cool root run which means giving them a thick layer of mulch or leaf litter and a deep water in extended dry spells. It is useful to plant them in Autumn and start with tube stock if available, therefore you are allowing them to develop their root system before spring comes and they should have a greater chance of surfing a hot humid summer. Keep an eye out for scale and other sap sucking pests but at the same time try to ignore this highly desirable native plant ;). My experience with waratahs is that root rot gets a lot of them. Good drainage is definitely the most important factor but they definitely need a good level of nutrition to flower well. Feed them with a low phosphorus fert while they are flowering. Then prune back behind the spent flowers and they will then take off through spring and give lots of flower bearing growth for next year.